Spoiler alert, Little Red now playing at Casa 0101 is the familiar story of the beloved children’s classic tale “The Little Red Riding Hood.” But it is also a refreshingly original musical that infuses this old tale with plot thickeners as deliciously complex as the love an overprotective single mother raising a rebellious teenage daughter. The story explores generational divides and bicultural differences that test traditions in our day and age. Of course, this is all explored through a musical score that combines punk, son jarocho, ballads and, yes, why not? Rancheras! Little Red has been playing to packed houses because of its very real appeal to young millennials and elders alike, as well as the musically inclined. 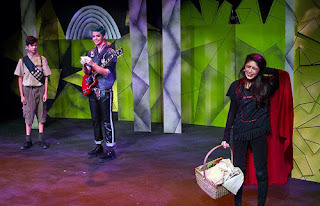 The play’s score—written and performed by Grammy-award winning musician and East-LA bred Quetzal Flores—is a most welcome and refreshing dose of ingenuity with a DIY punk rock twist that gets rid of the cheesy cringe factor often found in so-called timeless musicals. The script for the play is based on a story written by lyricist and playwright Anthony Aguilar and educator/actor Oscar T. Basulto. The tale is brought to life under the notable direction of producer Edward Padilla, working here with a repertoire of young talent whose artistic chemistry keeps the audience members enthralled as they join the central character’s journey to grandma’s house. Unfortunately for Little Red, a modern version of the fairy tales iconic heroine, the journey veers off course into the menacing Holly-woods, where a sign reads: “Welcome to Holly-woods, I’d turn back if I were you.” As in the real world Tinsel Town, chaos ensues when Red is tempted by all that’s shiny and punk rock. Red, the punk-loving teen who’d rather be texting and moshing in the pit, is obligated to make the trip along a real and metaphorical “sendero” (trail) by her mom, who is determined to instill discipline in her wayward child. Red’s mission is to bring medicine to her grandmother, without the benefit of GPS. And the kicker is that the clock is ticking the whole time. And like most annoyingly careful mothers, Red is sent forth with unwanted company, her overzealous childhood friend and wannabe scout Corky Woodsmán, who takes the noble mission of protecting Red a bit too much to heart. Corky brings along his faithful companion, an owl named Paz whose wise one-liners prove every word counts. It’s the battle of the cool vs. nerdy when Corky and Red encounter the object of her temptation. A sly Brit-punk teen canine with a baby-face and exotic British accent to boot, Don Coyote is played with a commitment to the role of trickster that is as tenacious as his turquoise-colored hair (tinted especially for this role by a professional stylist). The show is full of memorable lines, among them doozies like “Except for sopes, I love sopes” and “Don’t be like a hyena scavenging a bone.” The show is also filled with thinly veiled references to punk bands such as The Ramones, The Clash and The Crumbles (a fictional band from the film of the same name). Little Red also gets high marks for launching one of the best new imaginary live music venues in fairytale history, a place called “The Beanstalk,” which is renowned in the show’s seductive Holly-woods as a place where those that succeed may climb to meet their dreams of musical stardom and where they also, if they get greedy, run the risk of encountering a giant named Ego. Another show stealer is Red’s grandma, the hilarious Zumba-loving jokester who is uniquely prepared to uncloak Don Coyote of his “cool.” The production’s take on a children’s standard is a memorable diversion told through the eyes of an angst-filled teen. The show is worth seeing this unique blend of humor, spirituality and folklore. Bring your teen sister, your pre-adolescent daughter, your mom and your abuelita because you’ll miss them and wish they were there beside you laughing, smiling and singing along.